Finally we get to see some cherry tomatoes in Mombasa. 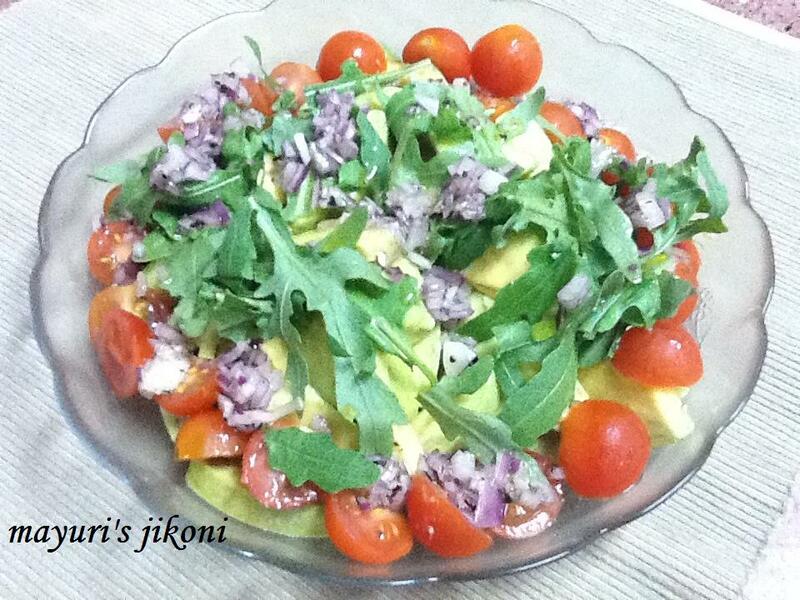 Cherry tomatoes and avocado and hey presto a salad is ready. Making the best use of the fine avocados till the season lasts. Add plum tomatoes or grape tomatoes if you get any. Basically any tomato will do. If you like, dress it with mayonnaise or any other creamy dressing. I prefer my simple vinaigrette dressing till I get down to making my own mayonnaise. Rucola, rocket, aragula are just different names for the same thing. Usually used in salads or in pasta dishes, it is rich in folate, magnesium, potassium and calcium.It belongs to the mustard family, hence the slight peppery taste. As soon as you cut the avocado, sprinkle a little lemon juice over it and mix it so that it does not go black. Add the tomatoes and rucola to the avocado. Use a jar to shake the dressing if you do not have a whisk. Can add any other green leaves if you like. If you are lucky to get yellow plum tomatoes, mix the red and yellow. Can mince the onion in a chopper if you like. Let the finely chopped onion marinate in the dressing before adding it to the salad.